Imperial, for families and gentlemen. This hotel, built to supply a want very generally felt, is distinguished for its architectural beauty, and for the extent and completeness of its appliances for the comfort and convenience of its guests. Visitors hitherto have experienced considerable inconvenience from the want of sufficient good hotel accommodation at Malvern, but we have no doubt that the establishment of such a first class hotel as the Imperial will induce numbers to visit the beauties and attractions of the country in the midst of which it is situated, and to enjoy the well known salubrity of the Malvern Hills as a place of temporary residence. We understand that the arrangements are nearly identical with the continental hotel system. The Foley Arms Hotel, recently enlarged and remodelled, stands on the slope of the hills, with large garden attached. This Hotel may now fairly rank among the best in England. It commands the finest views – has received the highest patronage – and we believe has been in the hands of the present proprietor several years. The Abbey Hotel, situated near the Abbey church, was built in 1850. The comfortable arrangements for families at this hotel, we have heard most favourably spoken of. 2 miles from Great Malvern. *Hotels* – Essington’s; Admiral Benbow; St. Ann’s, and Holywell. 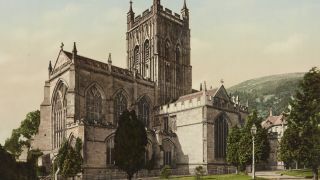 situated on the opposite side of the hills to that of Great Malvern, and distant from it about 3 miles by the turnpike road, but not more than 1½ mile across the hill. *Hotel* – The Westminster Arms. A healthy, fashionable, and agreeable watering place, consisting of Great and Little Malvern, about four miles apart. Both lie on the slope of the Malvern Hills, a long blue smooth ridge, on the borders of Worcestershire and Herefordshire, dividing the valleys of the Severn and Wye. The Worcestershire Beacon, near Great Malvern, is 1,300 feet high; while the Herefordshire Beacon, near Little Malvern, is 1,440 feet. Limestone and sandstone, with sienite, granite, &c, are the chief ingredients in this range, which is green to the summit, and produces excellent mutton. Though now rather bare, it was formerly well-wooded, and still offers much attractive scenery. But the chief recommendation, next to the mineral springs, is the pure and invigorating air, an advantage which renders it well adapted for the fashionable hydro-pathic, or Water-Cure, system here carried out with much success at the establishments of Drs. Gully and Wilson. Its merits, and the scenery of the neighbourhood have been described by Lane and Bulwer. Sheridan Knowles and his wife (née Miss Elphinstone), were patients. Hotels and boarding-houses are numerous, and the walks and drives of great beauty. St. Anne’s and Holywell, springs much resorted to, are slightly tepid and sulphurated, and useful, especially in glandular and skin complaints. Pumprooms are attached to each, and a church has been lately built at the Holywell, which is nearest Little Malvern. 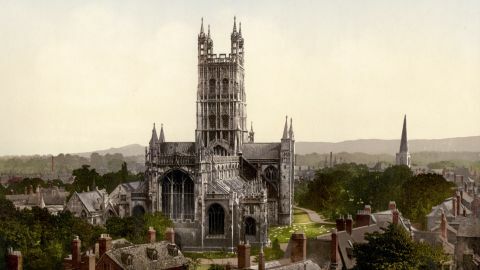 Great Malvern Church is a handsome later Gothic cross, built by the Sir Reginald Bray, who designed Henry VII.‘s beautiful chapel at Westminster. It contains some ancient effigies which were in the former church, and a modern tomb, by Hollins, to Mrs. Thompson, of Malvern Priory. This seat adjoins the gate and other remains of a religious house, founded at the Conquest, of which the author of the Visions of Piers Plow men was a member. The parish church of Little Malvern also deserves notice for its antiquity, stained windows, &c., though it is partly dilapidated. The seat of Lady Clare, an old timbered house, and the Roman Catholic chapel, are picturesquely situated. Great Malvern church also possesses some good painted glass. 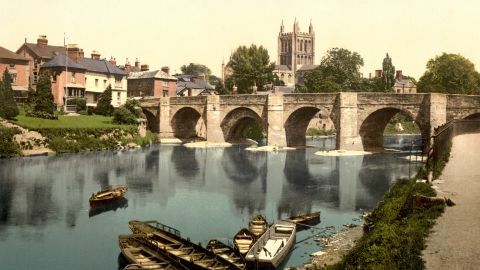 The prospect from the hills embraces part of eight or nine counties, including the vales of the Severn and Evesham, or the Avon, the cathedrals of Worcester, Gloucester, and Hereford, Tewkesbury Minster, the Welsh Hills, &c, and is the finest in the kingdom. The beacons above-mentioned were fortresses which commanded the passes through the hills. 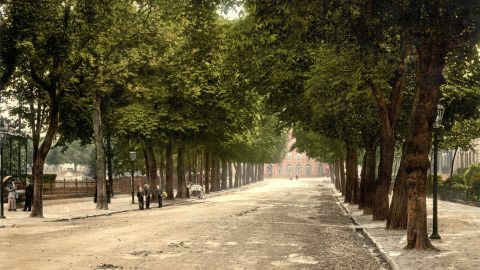 In one part are sewn the remains of a trench which marked the boundary of the chase as divided between the Bishop of Hereford and the Duke of Gloucester.